Family dynamics: The black sheep is often an easy punching bag. I take my son and daughter, aged 12 and 14, on monthly visits to old family friends. They have a 22-year-old girl who dropped out of college and got into bad company. Her parents sent her away for a while, and though she is back now, no one speaks to her properly and she is not involved in family functions. I want my kids and I to be able to make some gesture towards her, and include her in conversation. However, the elders in the family tell my kids to learn from her example and not to go astray. How can I inculcate a multidimensional approach to life and people in my kids? Your sensitivity to this person is commendable. While you cannot do much from the outside, your kids could take her something enjoyable to read, you could ask her family to let her come over to watch a film, or go for a meal with your kids…basically, treat her like someone who amounts to more than her “misdemeanour", whatever it was. You could try speaking to one of her family members, but step carefully here as they may not appreciate your advice, however gentle. Besides these activity-based gestures towards her, perhaps it would also be useful for you to understand the “mechanics" behind this “black-sheeping" that families do. 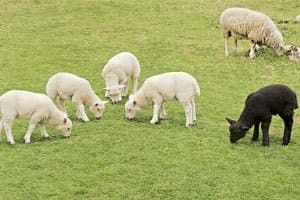 While a black sheep is often a source of much trouble and worry to a family, there are times when people around him are “invested" in his or her bad behaviour: He or she serves as a convenient “big problem" behind which a lot of smaller, but crucial, problems are neatly hidden. The black sheep becomes, in a way, a convenient punching bag and a good distraction from people’s own life issues. In comparison with the crimes and misdemeanours of the black sheep, our own smaller maladjustments and areas of dysfunction seem like nothing, and can remain unchecked. Take the example of 19-year-old Utkarsh. His troubles began when he could not clear the class XII exam despite two attempts. He stopped going to college, began to drift, indulging in minor delinquent and criminal activities, picked up a few addictions, and is now in therapy. Undoubtedly, he has been a cause of great anxiety to his parents and family. However, since everyone was busy discussing “the Utkarsh crisis", what the family could ignore was the fact that his father was verbally and physically abusive with his wife when Utkarsh was younger. Other extended family members, too, have some minor or fairly major issues that need to be straightened out and addressed. But Utkarsh provided the perfect “diversion"—so nobody needed to do anything about a married uncle’s blatant womanizing, or someone else’s neglectful parenting. You don’t need to spell all this out to your children. Without trying to get your children to be “charitable" towards this girl, you could simply create time for some interaction with her.